Communicate relevant and meaningful messages to potential customers on digital billboards that run 24 hours a day, 7 days a week. New South Outdoor is a digital billboard company with signs in the East Alabama market area. We have been working in the out-of-home advertising industry for over a decade now and we know how to create great advertising campaigns that will help get customers to your door. We’ve learned what works and, more importantly, what doesn’t. Our main goal is to make sure that your advertising investment shows returns for your business. Contact New South Outdoor to discuss an advertising program that fits your needs. 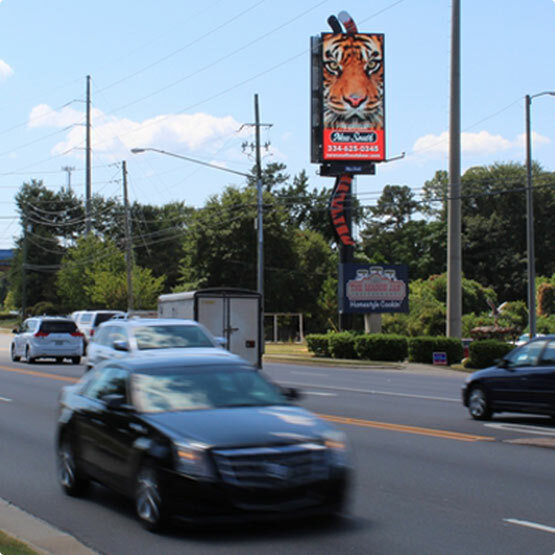 Our outdoor displays are located on some of the busiest streets and highways in Auburn and Opelika. Because people are constantly on the move, we are able to spread your message by reaching a high number of your potential customers. Our customers have the creative freedom to change their ad as often as desired without any additional cost. Advertisers have the ability to react to what works and change what doesn’t while eliminating time and printing costs. With the ability to change your ad immediately, digital displays keep your creative current and allow you to target your customers with the most time-relevant message possible. Drive desired business outcomes by reaching your target market with a timely message at the right price. Reach your Target Audience 24/7 Text Content: Our billboards are illuminated day and night to capture consumers who are going, doing and spending.